My Little One and I have reviewed Num Noms earlier series before and if you want to read our first review, you can see it here. 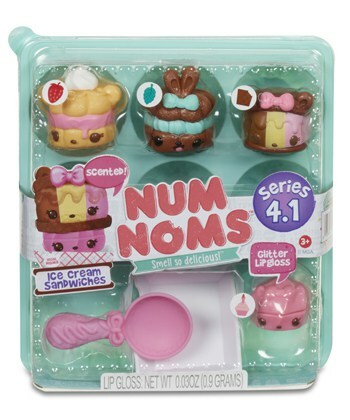 For Series 4, there are some pretty exciting new products in the Num Noms lineup. Num Noms are not just a collectible series for Series 4 and read on to find out why……..
We just checked out a number of the Series 4 products to see what they are all about and here is all we tested…. We had our work cut out for us with checking out all the above products as when you open them up, they are not just a collectible figurine. Let’s start with the Series 4 Mystery Pack. There are rare glitter nail polishes in some of the Series 4 Mystery Packs. As these are rare, they are more difficult to find. 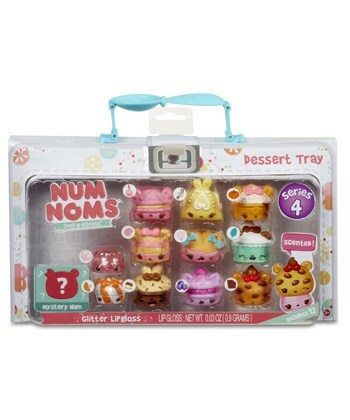 We have 5 Series 4 Mystery Pack Num Noms to open and did not receive a double in any of them. Here is the lineup that we got…. You can tell from our 5 Num Noms above that we got in our Mystery Packs that we got 4 nail polishes and one lip gloss. The nail polishes have something out the top of the Num Noms’ head and the lip gloss is a smooth, complete cover over the lip gloss container. Next in line was the Ice Cream Sandwich Starter Pack. The Num Noms can be mix and matched or stacked to build a scented ice cream sandwich. Each Num Noms fits over the Glitter Flavored Lip Gloss. The Series 4 Lunchbox Dessert Tray is a larger collection that the two previous. You can see on the Dessert Tray package above that there is a question mark hiding a surprise Num. Any time there is a surprise in a box, I find it brings the excitement a lot higher for kids. I know my Little One cannot wait to get into the packaging to see who the surprise Num is. 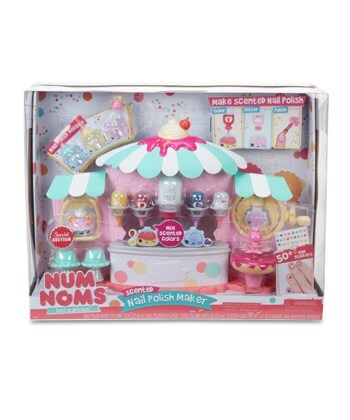 The above Series 4 Num Noms products provide you with characters in the collectible series along with either nail polish or lip gloss. I can definitely see young girls having their Num Noms lip gloss in their purse and loving pulling it out to put some on. They are really adorable and the scents are scrumptious. The nail polish is fun indeed. I recommend getting the nail polish away from the actual Num Noms just so there are no accidents where a Num is getting nail polish on it. Wipe the containers before putting the Nun Noms back on the nail polish just in case there is any nail polish residue. 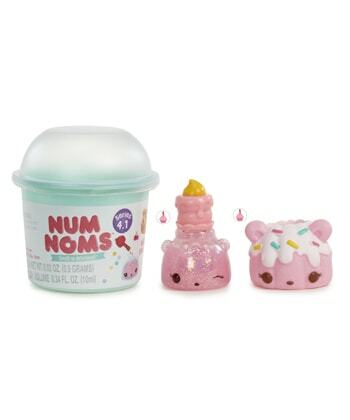 Depending on your little one’s age, the nail polish Num Noms are an item that may require supervision as with any nail polish product. The last product we reviewed was the Series 4 Num Noms Nail Polish Maker. I have read a number of reviews on the Series 4 Num Noms Nail Polish Maker and they are mixed. People seem to either fall totally in love with it or hate it. So why is that? It boils down to what your mom instinct is telling you when you read about this product…….it can be messy. So if you are getting the Nail Polish Cafe, you need to approach it with the idea that this is a parent/child activity. The Series 4 Num Noms Nail Polish Maker can be a really fun experience. Just clear a space to do it, have all the materials there and lined up ready to go. Have a wet cloth handy just in case. Don’t force or over squeeze anything. Be patient and help your little one with the squeezing and mixing. We really love the Num Noms products. We love the characters as they smell scrumptiously amazing and are beyond adorable. The characters are squishy, fun to play with, and are often out when friends come over for some imaginative playtime, sniffs, and squeals at their adorability. The added lip glosses are amazing. I love when my Little One gets the lip glosses and so does she. Of course, my Little One also loves the nail polishes and they can be a ton of fun come mom and daughter spa day, but I do have rules around nail polish to ensure I keep my sanity and my house nail polish free. 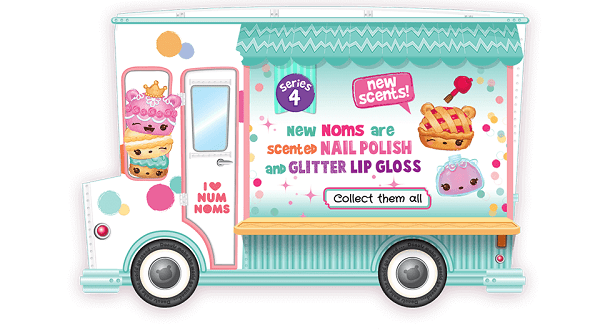 With these rules, we all can enjoy our Num Noms nail polishes. The Num Noms collectible series takes it a step beyond just characters you can collect because of the added scented lip glosses and nail polishes you can collect. The Nail Polish Maker really goes a step beyond by getting your little creator mixing and making her own nail polish.